Ok, so you guys probably have figured it out by now that I love curry. Yes it's true. I love all kinds of Asian foods, but curries are some of my favourites. They are easy to make, flavourful and the mix of spices just smells so good; especially the Indian and Thai ones. Japanese curry though is a little different. I found that it's a little sweeter than Indian curry and either very mild or not even spicy at all. It's a little closer to Thai curry, but kind of in between with the Indian one. The flavour is pretty unique and I think it's a lot more accessible to people who are a bit fussy about foods that are too spicy or too aromatic. 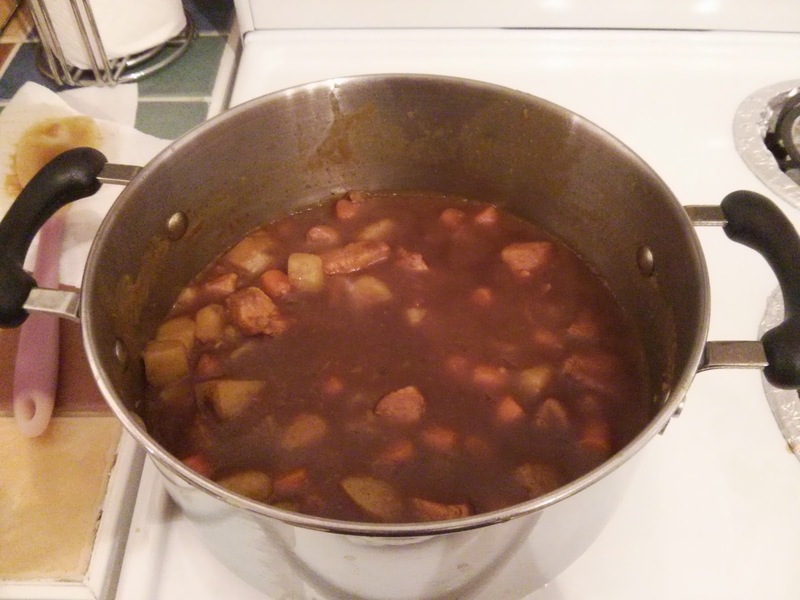 And its texture and consistency resembles a lot that of an ordinary beef stew. 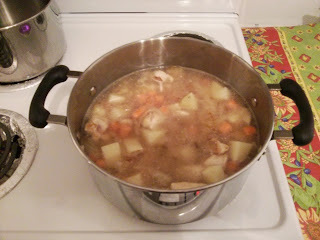 I've never done Japanese curry before so this week I decided to make some for myself. I bought some potatoes, carrots and onions. 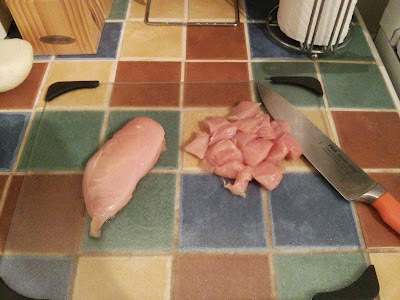 I also thawed out some chicken breasts I had in the freezer. 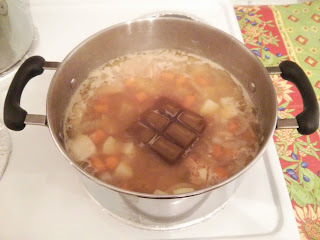 And I visited the Korean Japanese grocery store in NDG and bought myself a box of Japanese curry broth cubes. That, with a side of white rice and I was all set. Lemme show you how I did it and how it turned out. First off, clean up your potatoes and cut 'em up into small cubes a little less than an inch in size. Follow up with the carrots if you have the large carrots and do the same. 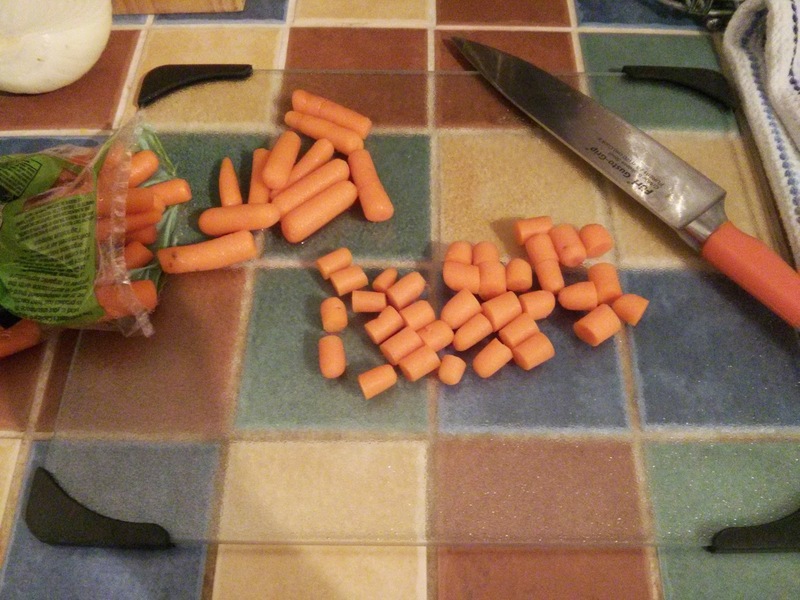 I just cut my baby carrots since they're already clean. 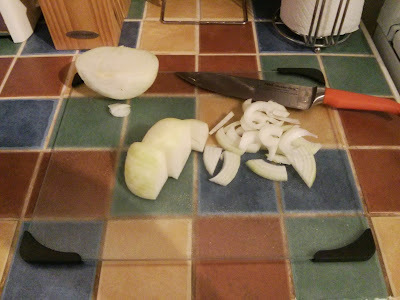 Then cut up the onion into big pieces. 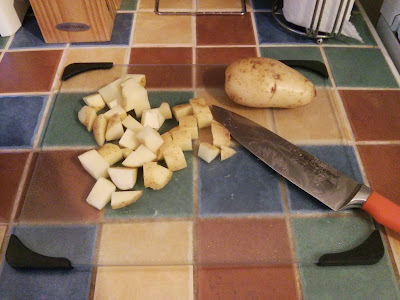 Don't mince it, we need to keep the pieces big so we can pick them up with the rest of the vegetables in the curry. Finally, cut up your chicken breasts into 1 inch cubes. Now, it's cooking time. First off, add a couple of tablespoons of oil in a big pot, enough to cover the bottom, and turn the heat on medium. 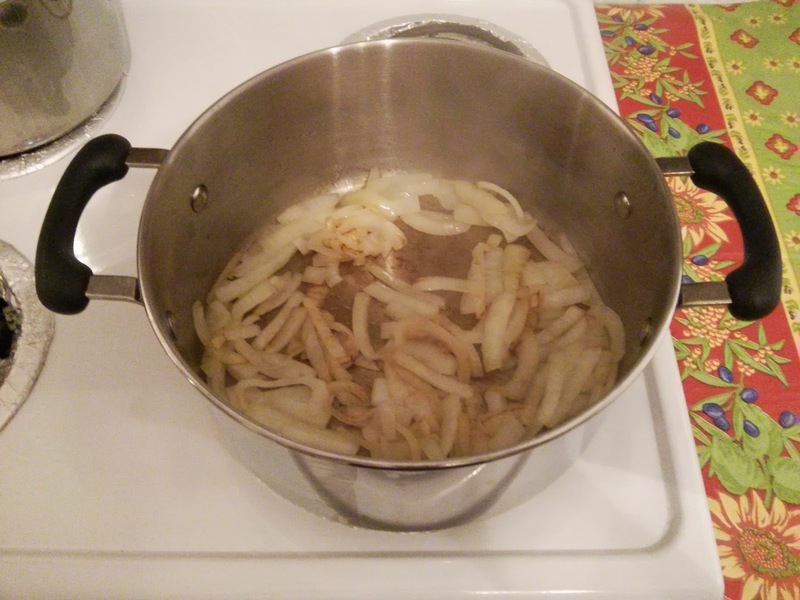 When it's getting hot, start frying the onions until they are caramelized and slightly brown. When that's done, put 'em aside somewhere. 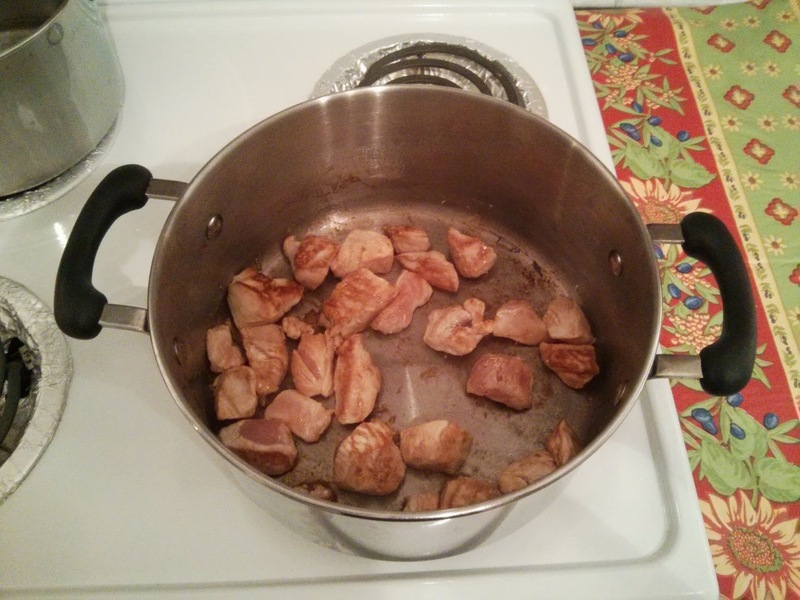 Then add some more oil and start cooking the chicken cubes. Just cook them enough so that you get two sides browned. You don't need to cook them thoroughly because we'll boil them in broth later on. When the chicken is browned, add all the vegetables. 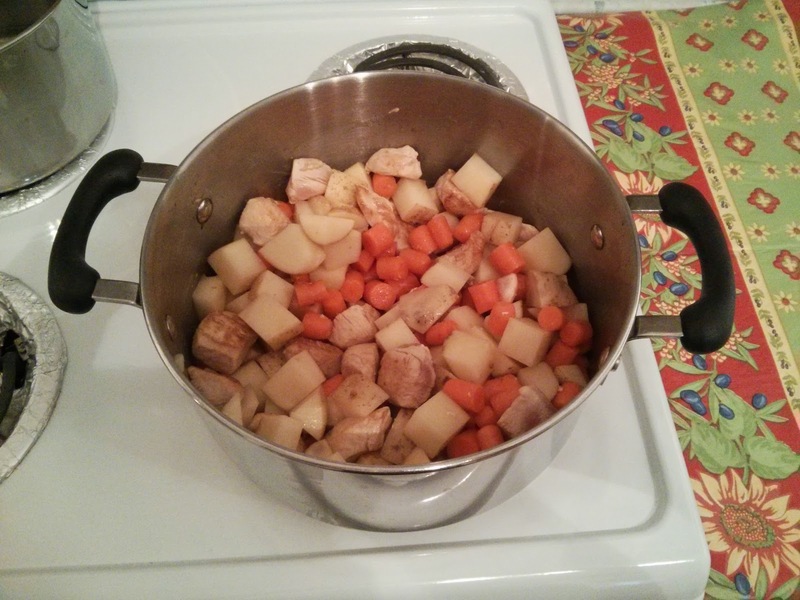 Potatoes, carrots and caramelized onions. Then mix it all up real good. Then look at the curry sauce package and check how much water you're supposed to add. In my case, their recipe calls for 5 cups of water for the whole package. So add that and bring to a boil. 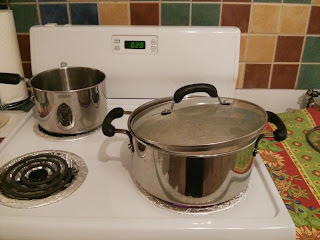 When it starts to boil, lower the heat and bring to a simmer and cover, leaving a gap to let some steam out. At that point, add the entire package of curry sauce cubes into the mix. The whole thing. Not just one half of the box, like my stupid self did. Mix it well until broken down and fully diluted, then cover again and let simmer for another 10-20 minutes, or until the vegetables are soft. Yeah, see here? There should be two pieces like this in there. The consistency of the sauce should be thick, like a stew. So, in case it's too watery, leave it on the heat to simmer, uncovered, and stir once in a while. The water should evaporate and the sauce should thicken to look like this. When that's over, serve with a side of white rice and you've got yourself a nice, warm Japanese curry! 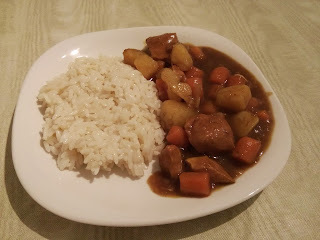 When I lived in Japan a couple years ago I would make curry at least once a week :D One of my favourite foods! 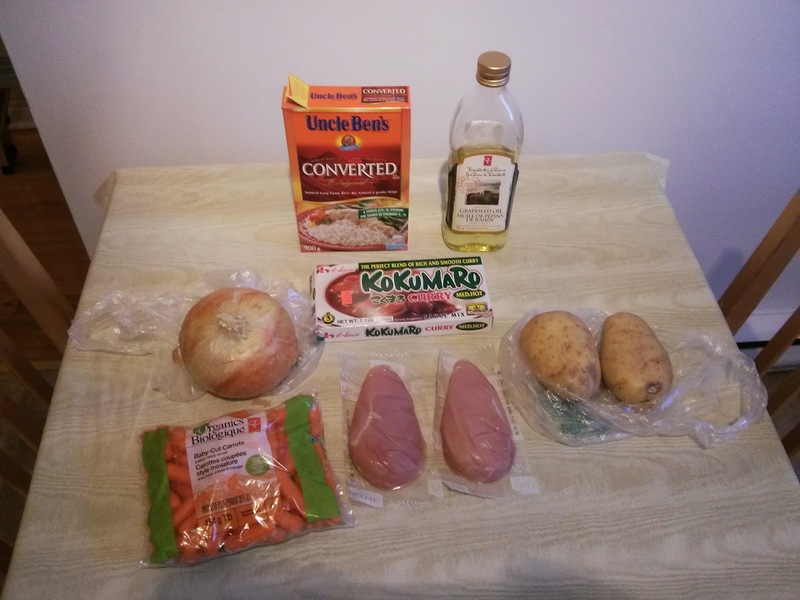 Its fun to experiment with different vegetables, meats (pork is really good), and testing out different orders of adding ingredients (I treat making food sort've like a new science experiment :D). One trick I used to make the curry thicker (but using less curry rue, is when you first fry the onions (I prefer green onions over normal onions), I add some flour in water (making sure that the flour is completely mixed). Now just imagine you are making porridge to get the consistency right. After a few tries its pretty easy to figure out how much flour you want for the correct consistency (I find it gives it more of a chowder like consistency than stew, I also like making chowders :D). Also, if you have *lots* of time, I recommend slow cooking the meat with a few of the vegetables with some alcohol mixed in (beer works good, but don't add too much or it will overpower and you'll need a beer with your meal for the curry to taste right :P). Usually 2-3 or more hours. Then add the curry mix and potatoes per usual. Wow! Thanks for the info Jacob! It sounds like this kind of curry is very versatile. 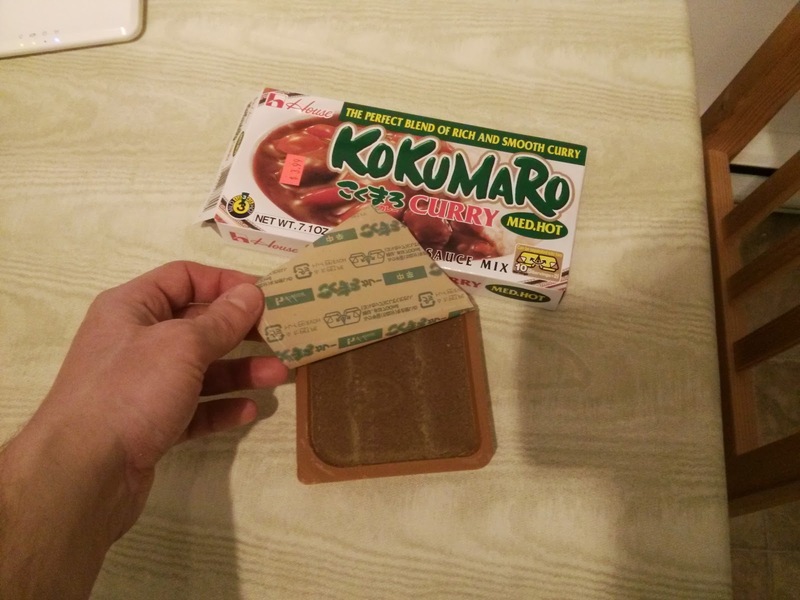 Chocolate in curry? Really? As for the meat, yeah I could've used pork, but I just happened to have chicken on hand. I heard of the flour trick before. I ended up having too much water for mine because I only added half the box and added enough water for the whole thing, which was way too much. I let it boil until it thickened because the mix is already starchy anyway. Next time I'll use your flour trick though and save some time. *sigh* I know, I know. But, they're just so darn easy to clean when you have to work with meat. Especially chicken. No no no. No excuses. Go for wood. Wood is da bomb - easily cleaned, sanitary, and knife-friendly! Well then... there's only one thing to do I guess.